I’ve been physically and emotionally preoccupied with bushfires the last few weeks, with friends, their properties, native wildlife and some of the most beautiful places on the planet destroyed or under threat. The air quality’s been pretty horrendous even here in the city – what must it be for firefighters and local residents? – and I’ve had messages from friends in northern climes, who are telling me of snow in Cornwall UK and the horrific Polar Vortex that’s caused so much chaos in Canada and the US. So please forgive me for not keeping up here. In truth, I’ve been neglectful of writing anything. Written & directed by Dan Gilroy. This very stylish thriller is another Netflix production and I’ve read very mixed reviews since it dropped here at the start of February. Written and directed by Dan Gilroy, this reunites him with Jake Gyllenhaal and Rene Russo (Gilroy’s wife), who all previously worked on Nightcrawler (2014). 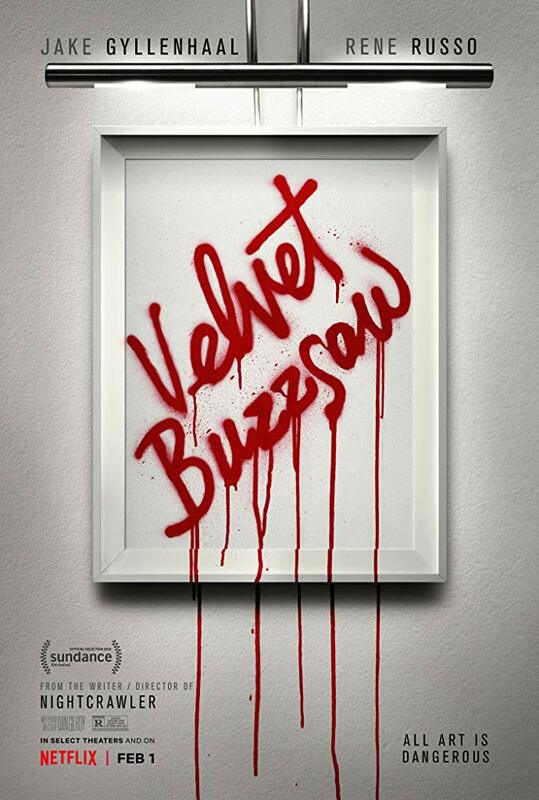 Where that film was a dark, noirish beast that centered on some very dubious characters, Velvet Buzzsaw is drenched in the sunlit and very elite world of the LA art market. Russo and Gyllenhaal lead a very impressive ensemble cast in this bitchy satire on the fine art world but there are definitely problems. Jake Gyllenhaal always impresses but I found his portrayal of the art critic at times almost a caricature of a young Andy Warhol. Russo is entirely convincing as a former punk who’s made a fortune out of other people’s talent, Toni Collette is delightful as the bitchy Gretchen and John Malkovitch is hilarious as the artist battling to create while sober. But at the core of the film is the mesmerising and often downright creepy artwork of Vetril Dease, which is stolen after his death by Josephina (Zawe Ashton), an art agent working for Rhodora Haze (Russo). As people start to make a lot of money out of this work, strange things start happening – I think you get the picture. While I mostly enjoyed the movie (it was a welcome relief from the real world) I found it quite clunky at times and think it could’ve done with a very different edit to lift some sections. Also, I felt this was a film caught between two genres, not quite being a full-blown satire and never being close to a true horror movie. Some of the death scenes are quite inventive and there are moments of definite creepiness, but I know this won’t satisfy horror fans. Fun while it lasted – but quite forgettable. We had a forest fire in recently in the hills behind Cote d’Azur, southern France. While these are frequent in the summer months, they’re almost unheard of in January! It’s increasingly difficult to predict weather patterns anywhere in the world! Thankfully, we’ve had some much needed rain tonight – gentle and steady!